by local artist Marilynne Bradley. 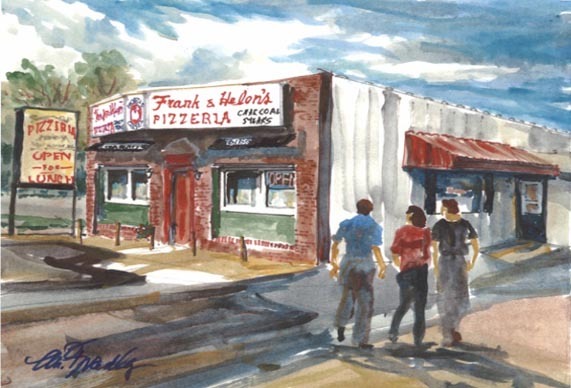 "The Frank & Helen's Story"
Our topic for this Antique Warehouse eating outing is one Frank & Helen’s Pizzeria which dates its ancestry back some 56 years. In the scheme of the days of our lives, that’s quite a long time, but, to pizza-pie, it’s like the blink of the eye as the food item we call pizza can be traced to the Babylonian region of Mesopotamia at about 1696 B.C. give or take a century of so. Today that area is called Iraq. Over eons this food item and what it’s called has changed little. The etymology of the word pizza, which some scholars say is of ancient Germanic origin, was used, according to records, at least as far back as 997 A.D. in the town of Gaeta in Southern Italy when it was related to ‘duodecimo pizze’ or twelve pizzas, which is an offering a tenant gave a landlord on Christmas and Easter. Another thought is that it relates to the Langobard German word “bizzo or pizzo” while other students of word origins give the nod to the word pita which was a flatbread popular in south-eastern Europe. Whatever the source of the name, pizza as we know and love it, became popular in Naples (Italy, not Florida) in the 17th century where it pretty much remained a regional food item until June of 1889. That was when, as legend has it, Raffaele Esposito, a Neapolitan chef, would, while tossing pizza dough, sing “That’s Amore,” where one line goes: “When the moon hits your eye like a big pizza-pie, that’s amore.” Alright, alright, I’m just kidding. Here’s the real legend: As Umberto, the King of Italy and his Queen Margherita of Savoy, were traveling through the kingdom, Raffaele had the opportunity to serve the monarchs a pizza he created and named in her honor…and the royal couple went bonkers over it. The Margherita pizza became a sensation and is now served in all pizza loving lands. The toppings which replicated the colors of the Italian flag were tomato sauce, tomatoes, basil and mozzarella cheese….Provel hadn’t been created at that time and wouldn’t be concocted ‘til about 1947. Mozzarella though had been popular in southern Italy since the time of Julius Caesar and it had to do with Anthony and Cleopatra, Egyptians and water buffalo. (Honest). With legends in mind we’ll touch on the real story of the origin of toasted ravioli at the end of this tale of Frank & Helen’s where today toasted rav happens to be the first item on their bill of fare even though according to a menu that hangs in their vestibule they weren’t serving the delicacy in 1960. But, back to pizza, since Frank & Helen’s is officially named a pizzeria. Today in the metro St. Louis area there are over 300 places that feature pizza and many other eateries have it on the menu. That’s a far cry from 1945 when I started what has become my perpetual pizza patrol. That was the year when Amadeo Fiore, the pioneer pizza-pie peddler hereabouts opened his low-ceilinged parlor in the basement of the 3 story red brick apartment-house named Melrose at the NE corner of Sarah St. and W. Pine Blvd where said building remains today under the care of Pete Rothschild’s Red Brick development company. Here in the 21st century opening a pizza parlor isn’t such a big deal since pizza emporiums are commonplace nowadays; but, as World War II was approaching its successful conclusion, Amadeo was a true visionary as his eatery was the very first in our town to offer these tasty topped Italian discs of dough. He named his creation “Amadeo Fiore’s Melrose Neapolitan Pizza-Pie” and billed himself as “The King of the Pizza.” A dining industry was underway. Here‘s the skinny on how it started. Fiore had a nice little neighborhood Italian restaurant frequented by a diverse clientele of scholars, professors and priests from St. Louis U, business people and residents from the area and a good number of entertainers who played places such as Tune Town ballroom at Olive and Theresa, the Circus Snack Bar of the Forest Park Hotel at W. Pine and Euclid, The Municipal Opera, both The American and the Grand theatres on Market, the Garrick theatre on Chestnut, the Club Plantation on Delmar and the Zodiac lounge, Starlight Ballroom and Chase Club of the Chase Hotel. Hack Ulrich, manager of Sam and Harold Koplar’s Chase Club sent many of the entertainers and hotel guests who craved Italian fare to Melrose, which was both near the hotel and stayed open ‘til the wee hours. Time and again these folks, many of whom had returned from a tour of duty in Italy, would tell Hack they’d really like to have a pizza, but, for love or money, you couldn’t find one here unless you were going to someone’s home, so Hack convinced the boniface of Melrose that putting such an item on his menu would be a culinary coup and pay off big time. Fiore told me he acquiesced in part because he feared some other restaurateur might get the bright idea, so he imported an oven from back east, developed a special recipe, of which I’m proud to say I have a copy that’s right from his kitchen, and the rest as they say, is history. Before long, fearing the midtown area was about to hit the skids he’d move to Easton Ave. just west of N. Kingshighway but before long he hurried off to Natural Bridge Rd. between the Goody-Goody and Terry Moore Lanes in a building that was exclusively his. In those B.P. (before Provel) days, pizza came one way – round; and in Fiore’s case he cut the mozzarella layered pie with shears. His original location would become Parente’s and finally Rossino’s. We’ll tell their stories sometime, but for the here and now Amadeo was just setting the stage for the many places to follow that would ballyhoo pizza such as: Pastori’s on Laclede, Cusanelli’s on W. Pine, Luigi’s on Watson, Di Martino’s on Shaw, La Contessa on Delmar, Marietta’s on Clayton, Charlie Mittino’s on Watson, Dettoli’s on Jefferson, Kemoll’s on N. Grand, Rinaldi’s on Delmar, Garavaglia’s on Watson, Yacovelli’s on Big Bend, Ponticello’s on Goodfellow, Pagliacci’s on Kingshighway, Staebell’s on Southwest, Lombardo’s on W. Florissant, Antonio’s on Gravois, Rose’s on Franklin…and scads more including our subject Frank & Helen’s on Olive. Rectangular shaped pizza trays came into being here at Luigi’s in 1953 when owners Frank and Luca Meglio noted that a table of 4 was usually ordering 2 round pizzas in part because it was almost impossible to fit more than 2 trays on their rectangular tables. Switching to rectangular trays resulted in many parties of 4 each getting their own pie. At the time the interstate highway system was getting started, Ike was in the White House and Texas Bruce and The Wrangler’s Club was on KSD-TV, Julius Seitz the brother Frank of Frank and Helen’s opened for business. It was 1956 when he turned his pizza oven on for the first time at 7303 Olive Blvd. at Midland and the sign read Jule’s Pizza Palace and a tradition that lives all these decades later was underway. By ’59 Frank Seitz and his wife Betty who lived nearby on Canton in University City took over and the name was changed to Frank’s Pizza. Then about a year later Frank’s sister, Mrs. Helen Wetzel became a partner in pizza and the new sign at 7303 read Frank & Helen’s. Their current address, 8111 Olive, had held another building that was once home to places such as Bill Scheider’s bar and the Subway Tavern, so named as it was in the basement. In ’58 a new building was built on that site to house Siwak’s Automatic drive-thru car wash, but by late ’65 the car wash was out and Bob Brown’s Executive Vending and Catering Co., was in and the car wash tunnel was redone to be a food operation. Frank and Helen’s would take over by ’67 while for a time still maintaining their operation at the old stand. But that 7303 Olive site would be taken over by Ennio Cardinale for his venture – Pino’s Pizza in 1968. Eventually Frank and Helen called it quits, but all the Frank & Helen’s traditions remained when they sold out to Scott and Mary DePolito. They in turn would sell the place to the dedicated current owners; Patrick and Rebecca Horvath who took the helm on September 5th, 2008 with the goal of keeping the status quo by continuing the Frank & Helen’s customs. And they’ve also kept an at least 52 year tradition alive by being the third couple to run the place. I think this family affair helps a good deal in giving the restaurant it’s home-spun and friendly come-as-you-are down to Earth atmosphere. Even though the interior and exterior of Frank & Helen’s, as well as the food, has changed little over time, the businesses along this busy stretch of Olive Blvd. which some still refer to as Olive St. Rd., has changed time and again over the last half century. Some of the stalwarts of the 1950s that have faded into the mists of time include: Lee Birenbaum’s Lee’s drug store which was on the corner of Midland next to the first Frank & Helen’s, Food Center which became a National Food Center, a Kroger and an A&P, Mowrey’s 5 cents to $1 store, Lipcin’s Department store, the Kosherette Delicatessen (and a half dozen other delis), the upstairs Arcade Bowling alley that was destroyed by fire in 1997, the Roma Italian restaurant, Hamburger Heaven, Dairy Dell Ice Cream, a Peoples-905 liquor store the Beverly (later Fine Arts) theater which is now a Chinese dining place, a Steak ‘n Shake and that chain’s local offices, Bonnee Frozen food, makers of the once famed Bonnee Buttered Beefsteaks, a TV (Top Value) stamp redemption store, Edith Walden Certified Cleaners, Velvet Freeze, and a long, long list of past places in just a 10 block section of Olive. If you like time-travel as we do, just pull in to the roomy Frank & Helen’s parking lot and step inside to be whisked to another dimension in time and space reminiscent of the 1985 flick” Back to the Future” which writer, producer (Michael) Bob Gale, who is now 61, based in no small part on his life growing up in University City and living at 7847 Gannon. These experiences included dining at Frank & Helen’s with his attorney dad and musician mom. One look at Frank & Helen’s place both outside and in will quickly tell you this is not some slick, national, cookie-cutter chain eatery, but a spot more like a local, feel good, forget the frills diner that was and is patronized primarily by hometown regulars ‘cause out-of-towners pretty much simply can’t find it. Even if you are from around these parts but have yet to try the place, watch for it closely as for some odd reason it’s easy to miss. I always tell people it’s next door to a McDonald’s and about an equal distance of some 4 blocks from North and South Rd. on the east and McKnight/Woodson Roads. on the west. Once you’re inside beyond the entry’s gum-ball games and signs proclaiming service club and fraternal meetings, you’ll find a single long dining room dotted with a dozen ersatz Tiffany hanging lamps, a few windows, mirrored walls, 14 hanging plants, a window to the kitchen that offers a good view of the pizza-making process, a nook that’s the hang-out for the staff and a friendly-feeling dining room almost overflowing with 13 vinyl (or leatherette) booths/banquettes and a sea of vinyl covered chairs and Formica topped tables. The décor all blends in to exude a feeling that this is a place of history and memories, a place of first dates, family gatherings, after the movies pizza, birthday and anniversary celebrations, business lunches, and romantic dinners. There’s a warmth, and feeling of home here that you need to experience to understand - and it’s almost as if you can perceive the many happy times of the past at Frank & Helen’s. Plus it doesn’t take too much thought to imagine how many a Studebaker, Nash, Hudson, Rambler, De Soto, Packard, Oldsmobile, Plymouth, Mercury, Pontiac or other car of years gone by rolled through this place when it was a mechanized car wash.
Frank & Helen’s atmosphere, which is a pure old-school neighborhood style, has changed little over the decades and it offers friendly familiarity with pleasant, though sometimes slow service and if you haven’t been there for years, it’s like going home again. Newbies may understandably imagine that they’ve entered a time warp that’s taken them back to when people bought music on Hi-Fi 45s and LPs from a place such as Paul Turner’s “House of Music” Record Shop on Woodson Rd., rode Public Service company streetcars, took dancing lessons from Ray Quinlan Studios, drank milk from Quality Dairy, went to town to see movies at the Loew’s State theatre, enjoyed coffee from Old Judge or sipped a Falstaff at Paul Spica’s Lounge in the Ford Apartments at 14th and Pine Streets. Even many of the menu choices are much the same as they were in the 1950s. You can still get their very unique one-of-a-kind pizza-pie, fried-chicken (which is now Broasted – more on that later), onion rings, spaghetti, mostaccioli, garlic bread, fried shrimp, meatball sandwich, and so on; but sorry to say the prices had to keep up with the times. Back then pizza prices ranged from $1.30 to $5.50 while in the present they’ll set you back from $7.29 to $24.99. Today spaghetti and meatballs runs from $5.29 for a small order and $7.49 for the large. An order of spaghetti with meatballs or sausage in 1958 was 95 cents. In that long ago time a half-pound charcoal broiled hamburger was 40 cents while nowadays the one-third pound burger is $7.29…but it does come with cheese. The one-half chicken dinner with French fries and cole slaw ran all of $1.35. On the current menu a half Broasted chicken with salad or soup and a side dish is $12.99. To help put these prices in perspective; if 4 people had each ordered the hamburger noted above as we were entering the 1960s; the tab would have totaled $1.60. Here in these inflationary times four burgers as earlier described would give you a bill of $29.16. Please keep in mind that such incredible increases in prices is universal and there‘s nothing we, or restaurants, can do about it. It’s like the price of gas. When Frank & Helen’s opened you could fill your car’s gas tank for $3 or less, today that’d be about $48 or more. The word pizzeria is part of the Frank & Helen’s name and they do it right sparing you from eating frozen pizza shells which leave SO much to be desired and giving you their original recipes of 62 years ago for dough and sauce. The dough which is freshly made there; which is the way it should be everywhere, but hardly is anywhere, has a wonderful flavor…good enough to eat without any toppings. The pizza which is cooked in the same ovens that were used in their original location in 1956 is slathered with home-made sauce and baked on stones and a bed of cornmeal and you can get yours extra thin, thin or thick. I’m a fan of the thin, but that’s just me. Your choice of sauces are signature red (that’s for me, too), pesto, Alfredo, olive oil, marinara and BBQ. For the cheese you can choose from mozzarella (yummy), Provel, cheddar or parmesan. My suggestion is to sprinkle your pie on arrival at its table-top stand with grated parm and a little crushed red pepper. I am not a fan of Provel. Actually I dislike Provel as much as I dislike fat on meat, instant tea or coffee, soggy bacon, tofu, sushi or non-dairy creamer. Frank & Helen’s offers 17 “regular” topping ingredients and 7 specialty items. A cheese pizza is usually just fine as far as I’m concerned though I often opt for anchovies, green pepper, pepperoni or mushrooms. The pizzas are offered in 10, 16 and 18 inch sizes with an 8 inch one ingredient pizza for lunch at $7.99. Another mid-day option is chili-mac, a dish that was created in St. Louis long ago at McTague’s restaurant in the Century building. The chili is St. Louis’ traditional Edmond’s brand. My suggestion is to put some ketchup on it with a dollop of white or red vinegar, pepper and parmesan. Lunch by the way is available Tuesday through Friday from 11 am. To 4 p.m. with 12 specials plus everything from the night-time menu. Even with the plethora of places purveying pizza in our town, and not that I’ve tried them all, I’ve only found a few that match the quality of the St. Louis style pies that we grew up with. My favorites then were Amadeo Fiore’s Melrose, Kemoll’s, Lombardo’s, Luigi’s, Parente’s, Derienzo’s, Rossino’s, Pagliacci’s, Slay’s Caruso’s, Marietta’s, both Cusanelli’s, Pastori’s, Gitto’s Isle of Capri, Helen’s, Di Martino’s, Antonio’s, La Contessa, Monte Bello, Pete’s, Cumpari, Sala’s on Newstead, Staebell’s, Yacovelli on Big bend, Ponticello’s on Goodfellow, Santoro’s, Farotto’s, Cimaglia’s, Rinaldi’s, Il Vesuvio, and Jule’s (it preceded Frank’s which became Frank & Helen’s). Even though there’s been an astounding increase in places that offer pizza, my list is shorter than in the old days, though I have to be frank, there are many establishments selling pizza that I’ve not tried. Here’s my 2012 list only in the order they come to mind and not in the order of quality or preference: Meglio’s, Vito’s, Frank & Helen’s, Ponticello’s on Bellefontaine Rd., Fortel’s on Mackenzie, Lou Boccardi’s, Farotto’s, Monte Bello, Happy Joe’s, La Pizza, Imo’s on Hampton, Maurizio’s, Lombardo’s at the airport, Cornerstone Café, Joe Boccardi’s in Columbia IL, and Pizza A Go Go. I hope to soon add to this list. OK, you may wonder, what the heck is Broasted chicken? I’ll first interject a personal note that while spending a day with George Harrison of the Beatles, when he came to stay with his sister Louise Caldwell in Benton IL, he and I had a lunch of Broasted chicken at the Bonfire restaurant of the Carousel Motel on N. Kingshighway and he loved it. That was in September of ’63 when basically nobody in the USA knew who the Beatles were. Oh, the motel is still there but the restaurant is history. Today the only restaurants on the Missouri side of the Mississippi near St. Louis serving Broasted chicken are Frank & Helen’s in University City, Burkemper’s in O’Fallon, and Rooks Gameday in Maryland Heights where you can only get it on Friday, Saturday and Sunday. In Metro east you’ll find it at: Nonna’s in Belleville and the Red Apple in Maryville. To offer Broasted chicken you’ve got to be a Broaster Co. of Beloit WI franchisee as only then can you get the specially formulated Broaster ingredients and cooker. The Broaster Company manufactured pressure fryer, a device that’s been around since 1954, is designed to cook each piece of chicken under pressure in the bird’s own natural juices which limits the absorption of cooking oil and allows for the Broaster marinade to penetrate deep to the bone as it sears the chicken with a golden crispy coating. I borrowed most of what’s in this paragraph from the Broaster Company’s web-site…but it really is all true. In the salad section of the menu you’ll find five choices plus 8 dressings, but our suggestion is to go with the small, which really isn’t small, House salad and get the unique and rich Frank & Helen’s original creamy garlic dressing. It’s super, but keep in mind they don’t spare the garlic. Some folks get a side of the garlic dressing to use for dipping pizza and French fries. Now, you can’t say I didn’t warn you that there’s a reason they call it garlic dressing and if you’re going for a job interview the next day you might be better off with the Caesar. There are over 30 additional menu choices, but it’s always either the pizza or the chicken and the salad with the garlicky dressing for me and I finish stuffing myself with some Crown Candy Kitchen ice cream. The only other dining spot to get that ice cream is Crown Candy Kitchen on N. 14th and St. Louis Ave. And when you go there, and if you haven’t you should, please consider ordering the Johnny Rabbitt Special which is a rich banana malt with fresh banana mixed with chopped nuts and topped with whipped cream and nutmeg. Be sure to tell them to make it with their home-made ice-cream. (I wish I could figure out why I keep gaining weight). Oh, I said we’d note the origin of toasted ravioli which happened in 1947 at Oldani’s Steak House on Edwards on The Hill which is also known as La Montagna and as the Blue Ridge. In a nutshell, a cook on loan from Angelo’s on Shaw accidentally dropped some ravioli into hot oil that he thought was water and the rest is history. The first person to sample what came to be called TR was Mickey Garagiola who was there on a rare break from working up the street at Ruggeri’s restaurant. We’ll file a more detailed ravioli report at a later date. It’s difficult to detect changes at Frank & Helen’s because there aren’t that many. As far as the menu’s concerned the only things to be dropped in recent years are the Philly cheese-steak and calzone and they used to put olive oil on the pizza before the sauce. Among the many things that have not changed is that they still make all their own sauces. In the opinion of the owners, Patrick and Rebecca Horvath, the place with pizza most similar to Frank & Helen’s was Helen’s on S. Grand at Potomac. There was no family connection. They have a third generation server and others who have been there for up to 18 years. Patrick worked for David Weber at 1st Federal Frank & Crust. Patrick and Rebecca met on a blind date at the Venice Café. The major change in the Frank & Helen’s neighborhood is a huge influx of Asians and Asian businesses. Tell ‘em Johnny Rabbitt of KMOX sent you. Written by: Ron (Johnny Rabbitt) Elz – Host of Route 66 Saturday nights on News Radio 1120 KMOX & KMOX.com, January 2012. Many who make the trek to Frank & Helen’s were first taken there by their grand-parents, and today many of these folks are introducing Frank & Helen’s to their grandkids, and so a tradition lives on. featured places from "Inside St. Louis"
what is "Inside St. Louis"?